As the average age of the “college kid” rises, and the number of years it takes the average student to complete the classic four-year degree climbs, schools are taking steps to ensure that their students – adults with busy lives – are able to succeed. A big part of this is online courses and entire programs, and another big part of this is offering college credit for work experience, professional trainings, and past education. Online schools and community colleges geared towards non-traditional students are great options for busy adults want to go back to school, but more and more traditional universities are now offering these options as well. If you’ve been working in the field for years but don’t have the formal education to get the jobs you want, visit our website at TheCareerPeople.com. 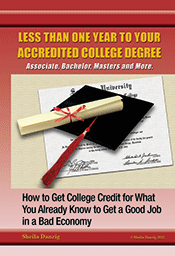 You may have already earned the credentials you need to achieve your career goals.